COLUMBUS, Ohio (AP) — Ohio State is trying to get back to business as usual while coach Urban Meyer is on paid leave, opening part of Tuesday’s practice to the media even as coaches and players remained off-limits for interviews. The first half hour of the Buckeyes’ fourth practice was open for observation and photography , with acting coach Ryan Day staying at the far end of the field working with quarterbacks. The Buckeyes typically open the beginning of selected practices and regularly make coaches and players available for interviews. But this hasn’t been a normal preseason camp so far. Meyer was put on paid leave last week amid questions about what he knew and did about accusations of abuse made against former assistant Zach Smith in 2015. The wide receivers coach/recruiting coordinator — who also is the son of the late Ohio State coach and Meyer mentor Earle Bruce — was fired July 23 after his ex-wife sought a restraining order against him. Ohio State has appointed a six-member team to coordinate the investigation and an outside law firm has been hired to conduct it. The university said the probe is expected to be completed within two weeks. 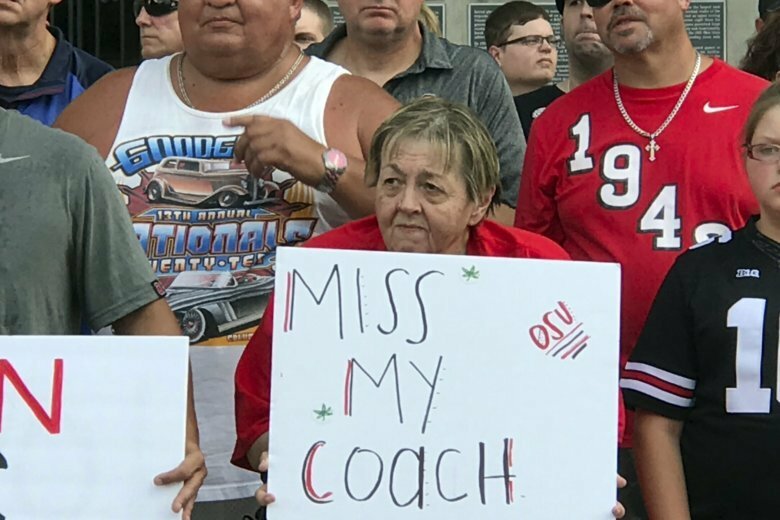 While players were checking in Monday evening to the hotel where they will stay during camp, around 200 fans rallied in support of Meyer outside Ohio Stadium. Among the chanting, sign-waving crowd was Stacy Elliott, father of former Ohio State and current Dallas Cowboys running back Ezekiel Elliott, who was suspended for six games last season while the NFL investigated domestic violence accusations against him. He denied any wrongdoing and was never charged. Stacy Elliott spoke fervently in favor of Meyer. Meyer initially told reporters at Big Ten Media Days on July 25 that he didn’t know anything about abuse allegations made by Zach Smith’s ex-wife Courtney in October 2015. In a statement released Friday via Twitter, Meyer admitted that he knew about the 2015 incidents and insisted he followed proper protocol. He also admitted lying to reporters about it. What Meyer knew and when he knew it became a question after college football writer Brett McMurphy reported that Courtney Smith had told Meyer’s wife Shelley about the 2015 incidents and shared pictures of injuries through text messages that she shared with McMurphy. Courtney Smith’s attorney said in a statement that Smith will cooperate with the university’s investigation. The Buckeyes open the season Sept. 1 against Oregon State.